It looks like Bill Ackman could make even more money off of his astute General Growth bet on commercial real estate. 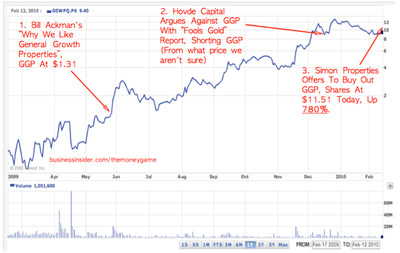 He’s already made past sceptics look pretty foolish as shown by the chart to the right. Simon sent a letter to General Growth this week saying it anticipates boosting its offer above that of a proposal put forth by General Growth and three of its largest stakeholders, the people said on condition of anonymity because they were not authorised to discuss the matter publicly. That means a new Simon offer would have to value General Growth above $15 a share. Simon’s initial offer valued the Chicago-based company at about $9 a share. Keep in mind he picked up his shares at $1.31, which means that if he gets more than $15, then he’s looking at more than a 10-bagger. 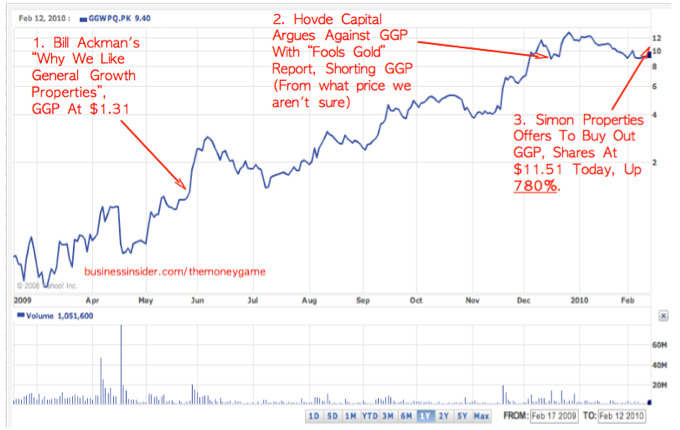 Hope Hovde Capital covered their short already.